I started Inspiring Mompreneurs because I care about Moms in business and feel they deserve to be applauded. As a Mom and Entrepreneur myself, I know how tricky it is to balance being wife, parent and housekeeper as well as managing all our other family obligations and maintaining friendships while building a business. And of course, as a Mom, I care deeply about children. Mine and others. My 4-year-old son started Ninja Zone classes at The Kids Gym Cape Town 6 months ago and it’s been brilliant for him. He absolutely loves doing his Li’l Ninja classes. He’s having so much fun, he doesn’t realise he’s also learning valuable Physical Literacy skills to help him meet his gross motor milestones. I’m always referring friends (and anyone who wants to listen) to The Kids Gym. So much so that recently I became the Business Development Consultant for The Kids Gym. It’s the perfect position for me as my son is a happy Kids Gymer so I’m totally sold on the concept and I’m also always networking with Moms in the area. At my interview, I was excited to discover the Owners of The Kids Gym have also started a Non-Profit Company, called Physical Literacy for Children (PLC). And on my first day as BDC, I became the Public Officer for PLC. I’ve done some Volunteer work over the years for various Non-Profit Organisations (mostly at Children’s Homes) and it’s been on my heart for many years to either start a Non-Profit or get involved as a Volunteer again. When I started my blogging, I always had the intention of finding some way to add a contribution page to my sites but wasn’t sure how. Finally, it’s all coming together. This is my first Contribution Page. And I’ve also just built the PLC website. PLC currently supports 150 underprivileged and Special Needs children. These children attend a Physical Literacy Fitness class once a week at The Kids Gym in Cape Town (Sable Square, Century City). It’s wonderful to see these children come in on Monday and Tuesday mornings and so beautiful to witness their progress. They leave hot, out of breath and smiling from ear to ear. Here’s a little glimpse into what happens here on Mondays when the children of Molenbeek School Pupils are here. 70% of Children at Primary School don’t achieve the minimum requirement of an hour of Physical Activity at day. Which is why we’re seeing, for the first time in history, more deaths in children from obesity than malnutrition (across the globe). Sedentary children usually become sedentary adults, overweight children usually become overweight adults. We need to give children a chance to turn this around as early as possible. Out of the 150 children PLC supports, currently, only 25 children are sponsored. The Kids Gym is bearing the cost of the remaining 125 children. AND there are so many more children at underprivileged and Special Needs Schools who would like our support. So we need donations. For as little as R 240 or $20 you can Sponsor a Child on our Program for a Month. Are you in a position to sponsor a child? You can either make a Donation to PLC via Payfast, from wherever you are in the globe. 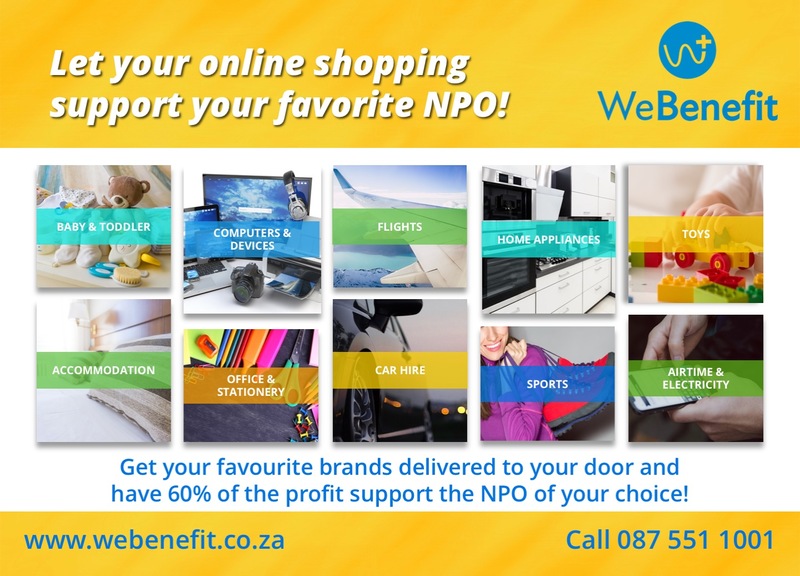 If you’re in South Africa and feeling the pinch, you could shop Online at WeBenefit for things you’d ordinarily be purchasing, like Airtime, Electricity and office supplies. WeBenefit gives you a way to contribute to a Cause you believe in, even when you have no available budget to do so. You do this by changing your point of purchase. For example, for the past 3 months, I’ve bought my household electricity via We Benefit. It didn’t yield a massive benefit to PLC, but hey, when I buy electricity any other way, I’m not donating anything. As you can see from the Screenshot below, I’m contributing R 19.22 a month totalling R 57.66 over 3 months. There are ways to contribute a lot more money via We Benefit. As a Mom Entrepreneur, you may be needing office supplies or equipment or household appliances. Shopping for a bigger ticket item, like a Laptop or Washing Machine, for example, can contribute a tidy sum, as you can see in WeBenefit’s online shop. I invite you to join me in helping underprivileged children get the Physical Education and the Physical Literacy Skills they need and crave. For less than $20 (R240), you can sponsor a child for a month. I think it’s such a wonderful thing what you’re doing with the Physical Literacy for Children program and it’s sponsorship through Webenefit. I didn’t think that children had the same sedentary lifestyles outside of North America as we do here, but I guess, with advancing technology, it’s affecting children around the world. I look forward to seeing how things are advancing with your fundraising, new blog posts and will make a donation as soon as I can. I will definitely be following you on Pinterest as well. Thanks so much Nicki. Yes, I’d be interested to see whether there are any parts of the world unaffected by technology. I think the move to sedentary lives is global, sadly. How kind of you to offer a donation. Please send me your Pinterest account so I can follow you back. Again I read another of your posts and I am amazed. I agree with you about the importance of having a physical education in our children. In my case since I was very young at 11-12 years of age I was going to a place very close to my house to play football, with older people. They were other times and it was spectacular. I have always done sports since I was very young. Now, reading your article, I now realize how important it was in my childhood. Congratulations, entrepreneur mom, you do very well in encouraging sports activity in our children. Thank you! Aw, Thanks Claudio. It sounds like you’re a lot like my hubby, he also enjoys competitive team sports and still plays Touch Rugby at the age of 54. 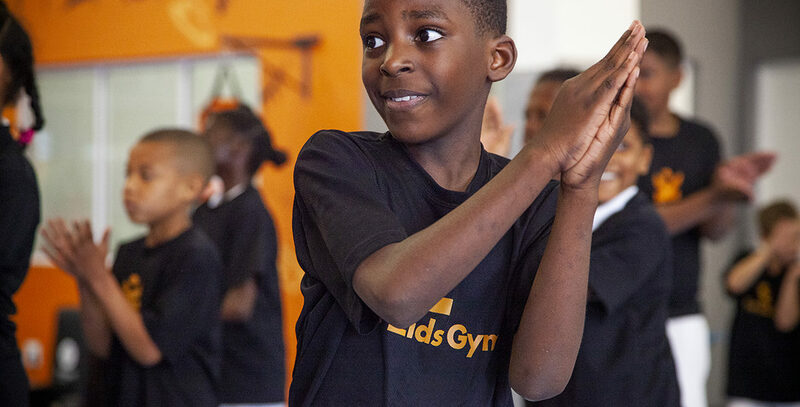 The Kids Gym has a slightly different focus to Sport, although it’s also physical activity, it’s in a supportive, non-competitive environment, helping children develop strong, toned bodies, balance, co-ordination and all the basic skills that would help them excel at Sports. Wow Im really impressed with this post. I have to say that I agree with your post, now in this present everything turns about the technology, every day I see more kids busy with their cellphones, the parents doesnt care about them at all, even they are between three years old and ten and they already has a cellphone or a tablet, they already are lossing this privilege to enjoy the life playing outside or in the park. It is very important to see for the health and happiness for our childs, I dont have a child right now, but I want to have two and definitely I want to do the same with them of what are you doing with your child, its really nice to see this kind of people who has this big importance in this situations. Your work is something to applaud for all the effort and of course to support it. Thanks so much for your comment, Emmanuel. You’re right, that’s the world we live in today. Too much technology, too little time in nature, doing fun activities like climbing trees and riding bicycles. When I was a child we cycled or walked to School. Children can’t do that any more, it’s too risky. In South Africa there’s been a huge explosion in the media lately about the number of children who are snatched, especially on their way to or from School. It’s so sad. This is very inspiring, I have always had a vision of starting a kids gym in my locality just never got to sit down and actually do a plan. It is good to know there are like minded people doing it in another part of the world. The fact that it is Non-Profit makes it all worth it. I will share this article around to increase your chances of getting more funds. Hi Anita, Thank You so much for offering to share this post. Hugely appreciated. If you live in the USA, Australia, UK or Africa, a Ninja Zone Franchise might be just what you’re after. The Owners of The Kids Gym were both Springbok (South African National) Gymnastic Trainers and have worked with children for years. Thank you for giving of yourself to help children. So many kids need an opportunity to improve and dream. I also see that you are affiliated with wealthy affiliate. I have talked to people about this company. I hear is is the perfect way to make money. Moms or dads can stay at home and work from their computer. That is fabulous. Or I guess they could be like you and help others to have better lives. Aw, Thanks for your beautiful comment Laura. Much appreciated. Yes, I am doing very well at Wealthy Affiliate. Let’s connect on the WA platform. Thank you for sharing this! The programs provided by both The Kids Gym and Physical Literacy for Children should, in my opinion, automatically be a part of everyday school curriculum. That level of supervision and activity is what every child should be receiving – especially those that are not interested in or are not able to participate in organized sports. Also, I’m all for anything that limits kids time in front of a TV or video game! As with any such program there is always a much greater need than resources and these programs seem to be very worthwhile investments in terms of time and contributions. Hi Susan, I agree wholeheartedly. And it’s been wonderful to see Schools who believe exactly the same as you do and are integrating our program into their School program. A beautiful article to read, I’m sure your boy is having the most wonderful time when he attends to his classes at the Kids Gym and Ninja Zone. I just watched the video to know more about what is it about, and it looks like it’s for sure lots of fun to do some exercise that way, and I’m sure it’s a great idea to motivate kids to keep doing exercise. I also think about the idea of the gym owners to get some donations to help children who can’t afford the cost to attend the classes, It’s a win win! I’m going to check on it and I’m also will share your article on my social media as I’m sure there will be more people who will be interested to read it and why not? … make a donation too! Hi Alejandra, Thank you so much for your lovely, heartfelt comment and for sharing with your own followers. You are a Star. This is the first time I have ever heard the term “physical literacy”. I’m not sure why but that is not a familiar term to me. I learned so much in this little article about things that I was previously ignorant of. I love what you are doing and it’s easy to see your heart in this endeavor. I wish you the best of luck. Hi Robin, it was a new term for me when I joined The Kids Gym too… and isn’t it wonderfully descriptive? Thanks for your positive comment. Thanks for giving a Dad’s perspective, Kenny. This was such an interesting article. It was amazing to discover that 70% of children aren’t getting an hour of activity a day. It looks like Kids Gym is a perfect place to turn that statistic around! I’m also very impressed with the work you’re doing in not only getting more people involved, but in promoting way that they can get involved in a way that will make a positive difference in the lives of children. As someone who has only lived in Western Europe and the U.S., I also feel as if my horizons have been expanded by getting to read about life in another part of the world. Thanks! Aah, Thanks so much your meaningful comment, Nancy. Yes, the statistic shocked me too. Life has changed so much since we were children and able to play outdoors to our hearts content. Everything is so much more controlled now, children don’t have the freedom we once enjoyed. We mothers do become supermoms for our kids’ sakes. I am proud of you for the great things you have done for the children. Also volunteering is never am easy decision but in your case, you’re an angel. I surely wish we have Ninja Zone here. I can not help but wonder, is it only in your area that Ninja Zone is at? It would be great to have my children join. It’s great to see programs like this. Sadly, in today’s world, playing outside seems to be fading away like the corded phone. Anything to get, and better yet keep, kids physically active is a welcome change. I have to admit, watching the video has me a bit jealous. I’ve always thought it would be fun to do all those flips and such. I’m 42 now so my mind may be a bit younger than my body, if you know what I mean. I’d be afraid I’d pull something if I were to try it now, LOL. I hope to see such a program to expand to more markets. Haha Scott, I hear you and feel exactly the same way. Once a month The Kids Gym holds a class for parents and their children. So one month it will be mother and child and the next month father and child. We also allow parents into the Gym with very young children (18 months to 3 years) for Kids Gym Tots classes. This truly is a great cause and I hope many people will be willing to help underprivileged children get physical literacy available to them. Your son looks like he is really enjoying himself there! My 3yr old twins are about to join the local children’s gym classes. Very much hope they like it! Judging by how much they run around the house, this will be the best thing ever! Very best of luck with your fundraising! Thanks so much Alenka. Ooh, what a wonderful outlet for your 3-year-old twins! Loved reading your post. My sisters kid has a problem with weight. Her and her housband are searching the way to make him loose some of the weight he gained. The only problem is, the kid doesn’t like sports at all. I think something like Ninja Zone would be quite perfect. The concept feels so good and I am sure the kid will feel like it. I saw that you also recommend it. Is Ninja Zone only available through The Kids Gym? Aah, hope there are Ninja Zone classes in your area. Click on this link to check: Ninja Zone Locations We have a few children who started out a year ago with weight problems who have lost 10 kg’s in a year. What it’s done for their confidence has been amazing. They are addicted to The Kids Gym and come often. It’s wonderful to see how they have developed a love for movement. And their parents say it’s affecting every aspect of their lives, even their school work and concentration is improving. I really liked your website, and how you are there for these beautiful children. There are so many opportunities for people to reach out in their own communities and help children who only want a chance at a better life. I wish I could help out from the United States, but your website has encouraged me to find opportunities here in Atlanta. We have so many single parent children who just need a break, any this kind of program would be wonderful for them. Thank you so much for what you do. What a wonderful thought, Clay. Maybe you could look into buying a Ninja Zone Franchise? Ninja Zone is huge in the States.